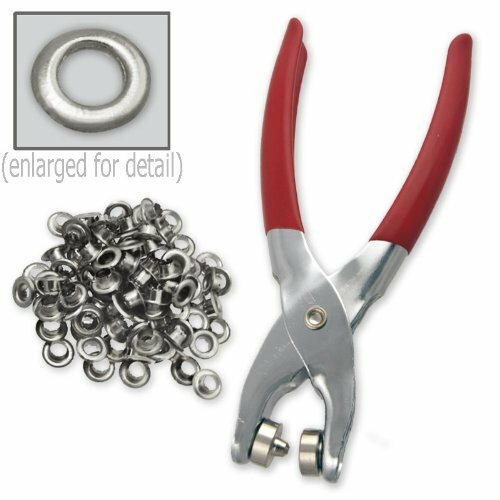 Grommet (or eyelet pliers) enable you to press eyelets & grommets into a variety of different materials for lacing and threading purposes (Source). Now, when it comes to the grommet pliers, if you're working on heavier materials, it's best to use a grommet press, or some other means, to drill the hole, and then use the eyelet pliers to affix the grommet or eyelet. The eyelet pliers we reviewed below are best used on lighter materials for smaller holes (in the comparison table we listed the sizes of holes they are designed to create). Many wonder, what is the difference between grommets & eyelets? In essence- they are fairly similar, but in general grommets are used to reinforce heavier duty materials than eyelets (Source). These Dritz eyelet pliers are designed to apply Dritz 5/32”-sized (3.96 mm) eyelets, and ¼”-sized (6.35 mm) eyelets. They ship with 8 plier tool fittings, 1 tool remover, 2 replacement inserts, and instructions. 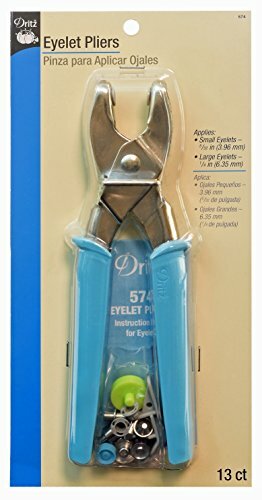 Dritz say these eyelet pliers are ideal for installing grommets and eyelets on shower curtains, belts, tote bags, purses, garments, for scrapbooking and assorted crafts projects. Let's take a look at 5 of the best-selling grommet plier kits on the market today and see how they compare. These grommet pliers offered by Dritz are well-made, comfortable to use, light, and suitable for applying small and large eyelets. Users love the quality and the price, but some do note that it’s hard to use them. The grommet pliers measure 9.4 x 4.9 x 1.1 inches, and they weigh 10.4 ounces. You can use them to apply Dritz 5/32-inch small eyelets and ¼ inch large eyelet. The package includes one pair of pliers, eight tools, one tool remover, two replacement inserts and a guide. You can apply eyelets to belts, shower curtains, purses, garments, and paper. A buyer comments that the grommet pliers are easy to use and that they are very effective for inserting eyelets. The reviewer adds that she used them to put eyelets on corsets and leather vest with no issues. Another customer shares that the instructions are well-written and that it’s easy to follow them. He also says that the pliers are strong and that you can put eyelets on canvas with minimal efforts. A satisfied purchaser states that the Dritz eyelet pliers are perfect for punching small holes and that he recommends them as the best grommet tool available. However, some customers have complained that the pliers don’t crimp eyelets completely and that they deform the grommets. Some users also note that the grips are uncomfortable and that the pliers are overpriced. These grommet setting pliers offered by ProTool are cheap, practical, ease to use, but poorly designed. Users love the price and the extra eyelets, but some do note that there are no instructions how to use the pliers. These 7-inch eyelet pliers feature a special hardened steel anvil and mandrel jaws, a galvanized finish, PVC-dipped handles for extra comfort and non-slip grips. The eyelet pliers use metal grommets that are self-backing with an inside diameter of ¼ inches and a barrel length of 3/16 inches. The package includes 100 grommets for canvas, vinyl, leather and other fabrics. But you should know that this grommet setting tool is made in Taiwan. In general, users have a negative opinion of the ProTool eyelet pliers, and they agree that the design needs improvements. A buyer comments that the grommet pliers crimp one side of the eyelet and that it’s useless. The reviewer also states that the handles are terrible and that they got bend after the second time he used the pliers. Another unhappy customer mentions that you need to apply considerable force to put the eyelets and that it doesn’t work at all. A purchaser adds that he couldn’t attach any eyelets with these pliers and that he returned them disappointed. On the other hand, a satisfied buyer says that the eyelet setting pliers work very well, if you use them correctly and that they are perfect for small projects. These eyelet grommet pliers offered by Katzco are affordable, light, useful and practical for home craft projects. 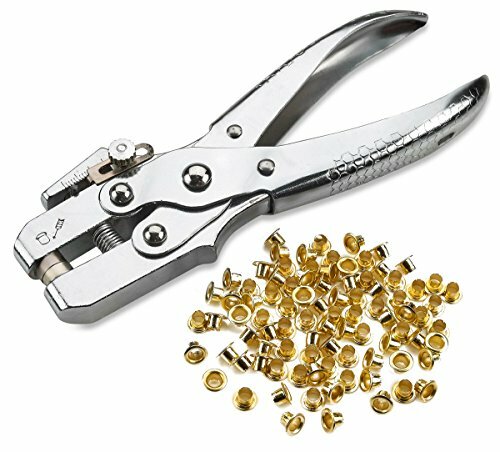 Users love that the pliers come with 100 free gold eyelets, but some do note that they are quite small. These eyelet pliers measure 8.1” x 4.2” x 1.1”, and they feature heavy-duty cast aluminum jaws, a steel mandrel, a steel anvil, a chrome rust-resistant finish, a weight of 6.4 ounces, and ergonomically designed handles. The jaws are specially constructed to align the anvil for accurate use, and they can punch through laminated cards, paper, pillows, blanket, canvas, leather and more. As a whole, buyers have a mixed opinion regarding the Katzco eyelet setting pliers. A user comments that the pliers are easy to figure out even though there are no proper instructions how to use eyelet pliers. The reviewer adds that the grommet pliers are only suitable for thin fabrics and it will be difficult to put eyelets on thick leather. A happy customer states that the grommet setting tool inserts the eyelet well and that you have to remove the small pin to open the pliers. Another user says that these pliers work just as he expected and that he is satisfied with the quality of the material. He used them on laminated paper, and he had no issues with them. On the other hand, a reviewer warns that the grommet pliers broke quickly, while another complains that he couldn’t get even a single eyelet properly set. These eyelet setting pliers offered by eZthings are cheap, easy to use, and suitable for various leather crafting projects. Users love the price, but some do note that they are flimsy made and fragile. These grommet pliers measure 7.8” x 3.8” x 0.8”, and they weigh 4 ounces. To use the pliers, you must place an eyelet on the hole side of the pliers to properly set a grommet. You also need to use a puncher tool to make a hole before using the eZthings eyelet setting tool. The package includes 100 eyelets size ¼ inches. In general, customers have a negative opinion of the eZthings eyelet pliers, and they agree that the pliers are not well-designed. A buyer shares that you can’t set a grommet with them and that the pliers are weak and bend quickly. He says that the pliers mangle the eyelet and that he doesn’t recommend them at all. Another dissatisfied buyer adds that the grommet tool doesn’t work on leather at all and that the quality is disappointing. A reviewer states that the pliers require a lot of force to crimp a grommet fully and that the handles are slippery. He says that these are one of the worst eyelet setting pliers available. On the other hand, a happy user mentions that the eyelet pliers arrived quickly and that it’s easy to use them. This eyelet setting pliers offered by Wisehands are well-balanced, reliable and efficient for setting or replacing grommets. Users love that the pliers are light and comfortable to hold, but some do note that the provided eyelets are of poor quality. The Wisehands setting pliers measure 7” x 0.8” x 3.2”, and they feature PVC dipped cushion handles for comfort, non-slip grips, special hardened steel anvil and mandrel jaws, and a weight of 4 ounces. The grommet pliers also have a steel body and a special black coating for durability. The package includes 100 eyelets. A buyer comments that he uses the grommet setting tool to punch holes through leather faux and that he doesn’t have any issues with its performance. He adds that you don’t have to squeeze hard to make it work and that the alignment is perfect. Another customer shares that the grommet tool is ideal for attaching eyelets on tarps, tents and canvas bags and that it works with 4 mm – 5 mm rivets. A user mentions that he had some concerns about the eyelet setting pliers, but they are well-made, durable and perfect for small home projects. However, some customers have complained that the pliers are difficult to use due to the spring-loaded action and that they the handles bend quickly. Some users also note that the eyelets don’t stay in place and that the pliers only flatten the grommet half way. What Are Eyelet Pliers Buyers Saying? The first pair of eyelet pliers we examined- the manufacturers say that they are ideal for applying Dritz's 5/32 inch eyelets as well as .25 inch eyelets for hole reinforcement (read Dritz instructions here). Most frequently these types of eyelets are discovered on purses, types of curtains, belts, garments, and scrapbooks and for different types of crafts projects. These Dritz eyelet punchers are designed to help you engineer the appearance of laced effects on your crafts, costumes, and clothing. They are also useful when you're working on scrapbooks and need to apply eyelets for heavier stock paper. One reviewer, who initially wondered the difference, 'eyelet vs grommet? ', told us that this tool can punch through fabric, cardboard without any issue, but you will have to pre-drill holes (using a grommet press machine) into things like leather, plastic and the like and then use the tool to fasten the eyelet for hole reinforcement. Though it should be noted that while it is equipped to punch smaller holes, some buyers were somewhat disappointed that it couldn't do quarter inch holes. When it comes to where to buy grommets and eyelets- users looked to local stores like Target, Lowe's, Walmart and e-retailers for quick shipping. One art and crafts professional told us that it has been a useful tool, helping her to punch holes into the fabric so that she can run cording through it. They also added that to create larger holes they use this tool to punch multiple times to create a larger aperture (another option is a hand rivet gun). Another reviewer said that the included eyelets did the trick- only requiring a minimal amount of pressure to effectively affix them to clothing projects she and her daughter were working on. 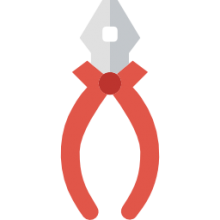 Another buyer did note a negative experience saying that in her opinion the pliers are poorly made- saying that she was unable to affix the eyelets on to her sewing project surface. That said, some buyers thought that this individual was merely using the pliers incorrectly or perhaps on a surface that was too tough for the pliers to do their job- and that a large grommet tool might be best. A reviewer told us that in order to use these effectively, you'll want to arrange it so that the portion of the eyelet designed to display is sitting on the flat side of your eyelet pliers- and then apply pressure just enough so that it doesn't fall out of the pliers. Then you just need to move it around a little bit to make sure that it is laying completely flat and then apply pressure. The second pair of grommet setting pliers we looked at was the ProTool option. These eyelet setting pliers are designed for the DIY crafts person as well as professionals who are looking to embed their own eyelets and Dritz grommets. They are 7 inch pliers designed from hardened steel with mandrel jaws built to effectively squeeze and crimp your brass eyelets into place. There are rust-resistant galvanized finish is complemented by a handle that is PVC dipped to ensure they don't slip out of your grasp while you are applying pressure. Unfortunately these pliers have received a great deal of negative feedback from the reviewers we spoke to. Buyers complained that the pliers ended up bending after minimal use; that the tools head is not completely aligned which means that the Dritz grommets are not completely flattened when pressed; that the pliers shipped with eyelets, but no washers- a perplexing situation. The third option we examined was the Katzco 3/16" grommet setting pliers- they are advertised as heavy-duty steel hole punch setters designed for canvas, fabrics and leather. The manufacturer say that they work on a truly diverse amount of materials that include acrylic, plastic, leather as well as many types of fabrics to create lacing effects on pillows, placemats, curtains, blankets and more. All you need to operate them is to line them up where you want to press the eyelet into, squeeze the aluminum handle to press the eyelet into place. One frustrated buyer who receive these pliers without instructions told us that it took a lot of Googling to figure out that in order to open the pliers from their locked position that you will have to remove a pin where the ends of the pliers come together. These grommet setting pliers have received mixed feedback with one buyer saying that they are undersized and inadequate for working on heavier materials like leather- best to get a grommet press machine for boring eyelet holes. One buyer we spoke to did say that they were able to get them up and running, setting eyelets at a quarter inch and a half an inch but more than that these grommet pliers are really not equipped to handle. Overall, while some buyers were able to get these pliers up and running, most said that they are not ideal for heavier fabrics, and even on a lesser materials they didn't provide the sort of secure and effective application of eyelets they were looking for. The fourth option we took a look at was the eZthings grommet setting pliers- they are advertised as effective tools for leather crafting, ship with 100 eyelets, and are designed for hobbyists and commercial-level users that need to set grommets after using a stronger punching tool to create the hole. Many buyers expressed satisfaction with this pair of pliers, saying that the pliers ended up breaking and bending after only minimal use, as well as being incapable of correctly setting brass grommets into the materials they were working on. 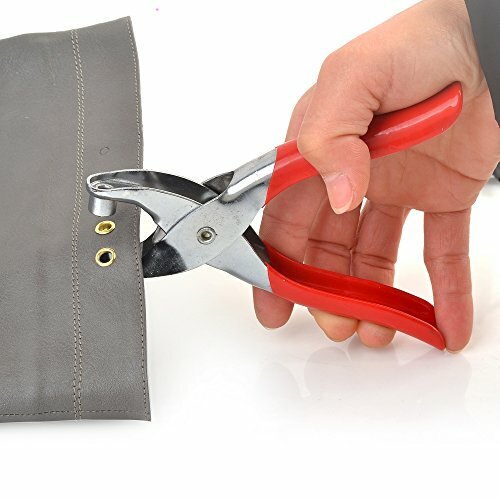 The last option we examined was the Wisehands eyelet setting plier kit- it is advertised as a quick and easy way to either install or replace eyelets on shoelaces, bags, clothing as well as heavier cloths. The manufacturer promises that during compaction these grommet pliers will securely fasten eyelets to create a professional and attractive appearance. Unfortunately, as with other grommet pliers we have examined, users tell us that these have been a broadly ineffective, and in some cases, a completely defective option for their purposes. There have been some positive experiences, though- with one reviewer telling us that once they realized this grommet plier would really only be effective for smaller styles of crafting projects and not on heavier materials they began using it for that purpose. As with many of the other options we have seen, once you begin working on leathers, it's best to drill a hole using a sturdier piece of equipment like a grommet press and then use these pliers to actually install the grommet in place.